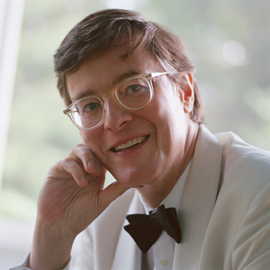 Recognized as an artist of passion and integrity, the distinguished American pianist PETER SERKIN is one of the most thoughtful and individualistic musicians appearing before the public today. Throughout his career he has successfully conveyed the essence of five centuries of repertoire and his performances with symphony orchestras, recital appearances, chamber music collaborations and recordings are respected worldwide. Peter Serkin's rich musical heritage extends back several generations: his grandfather was violinist and composer Adolf Busch and his father pianist Rudolf Serkin. In 1958, at age eleven, he entered the Curtis Institute of Music in Philadelphia where he was a student of Lee Luvisi, Mieczyslaw Horszowski and Rudolf Serkin. He later continued his studies with Ernst Oster, Marcel Moyse and Karl Ulrich Schnabel. In 1959 Mr. Serkin made his Marlboro Music Festival and New York City debuts with conductor Alexander Schneider and invitations to perform with the Cleveland Orchestra and George Szell in Cleveland and Carnegie Hall and with the Philadelphia Orchestra and Eugene Ormandy in Philadelphia and Carnegie Hall soon followed. He has since performed with the world's major symphony orchestras with such eminent conductors as Seiji Ozawa, Pierre Boulez, Daniel Barenboim, Claudio Abbado, Simon Rattle, James Levine, Herbert Blomstedt and Christoph Eschenbach. Mr. Serkin's recording of the six Mozart concerti composed in 1784 with Alexander Schneider and the English Chamber Orchestra was nominated for a Grammy and received the prestigious Deutsche Schallplatten as well as "Best Recording of the Year" by Stereo Review magazine. Other Grammy nominated recordings include Olivier Messiaen's Vingt Regards sur l'Enfant Jesus and Quartet for the End of Time on BMG and a solo recording of works by Stravinsky, Wolpe and Lieberson for New World Records. Mr. Serkin currently teaches at Bard College Conservatory of Music and the Longy School of Music. He resides in Massachusetts with his wife, Regina, and is the father of five children.